The Universal Magnetic Switch from Jeti is a dual pole electronic switch with four outputs operated with the magnetic key (Sold Separately). The advantage of an electronic switch is that it offers a virtual unlimited ON/OFF cycle, unlike mechanically operated switches. The Universal Magnetic Switch is designed for 3.5V - 59V input and supports up to four (4) individual devices connected to the ports. Output ports are divided to Master and OPTO, both sets of ports are optically insulated from each other preventing RF interference. 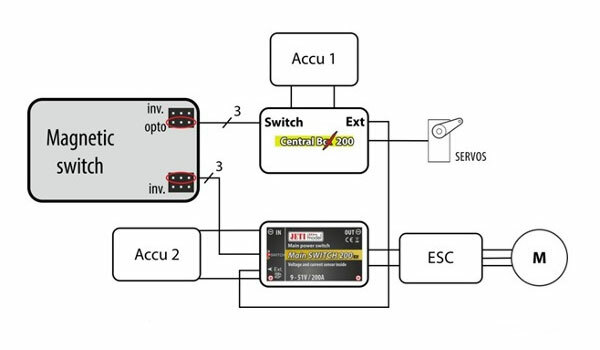 Each pair of the connectors has single standard and single inverted output, this setup enables you to connect and control simultaneously several Jeti devices. The faceplate contains an integrated LED to indicate the ON/OFF status of the switch. 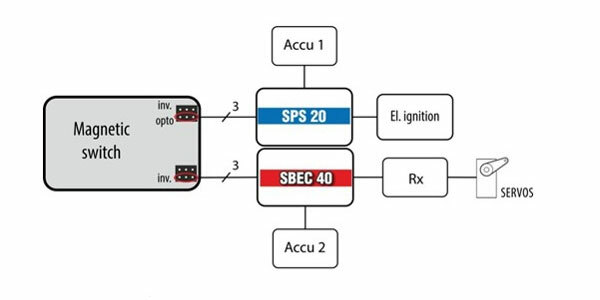 Should one the devices become disconnected from the switch, the device will stay ON and switch will remember its ON/OFF state.